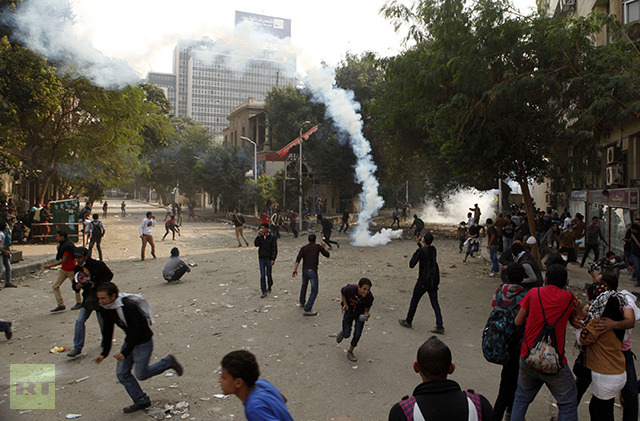 Police in Cairo used teargas against protesters after clashes erupted on Tahrir Square, leaving one dead. The violence came before a 100,000-strong rally demanding the country’s Islamist president withdraw decrees vastly expanding his power. 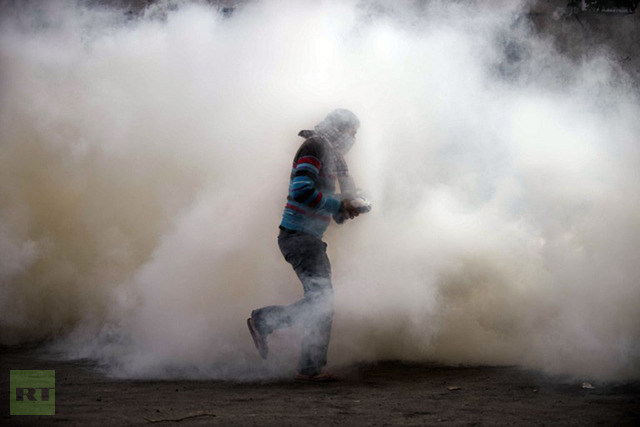 Police fired tear gas after hundreds of demonstrators began pelting them with rocks on a street between the US Embassy and the historic square which served as the epicenter of the uprising that toppled authoritarian president Hosni Mubarak nearly two years ago. 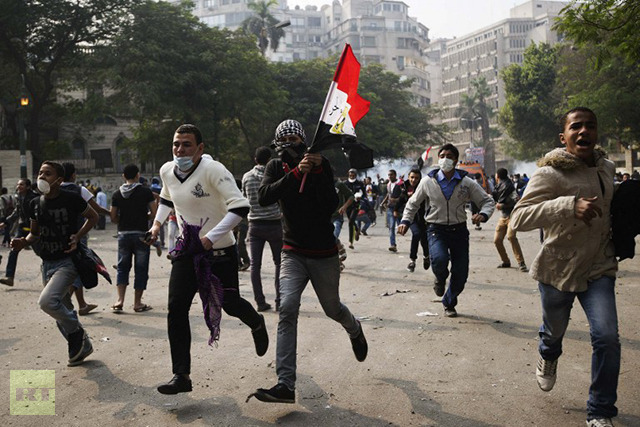 Meanwhile, protesters stormed the headquarters of the Muslim Brotherhood in the country’s second largest city of Alexandria. The crowd broke in to the building hurling papers and furniture from a balcony. 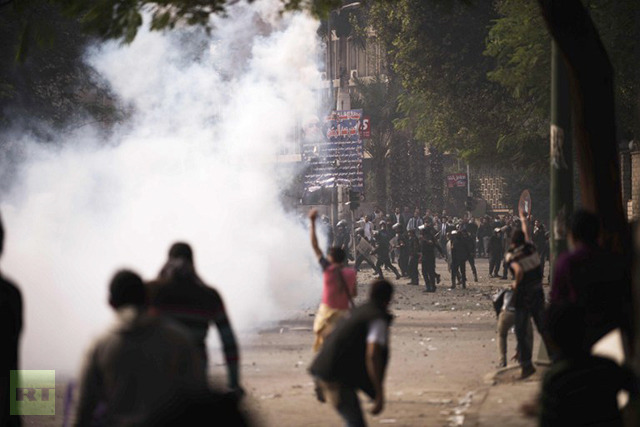 Activists reported that a protester in his 20s died in Cairo as a result of being exposed to too much tear gas, making him the fourth person to lose his life in clashes across Egypt over the last five days. Egypt’s ministry of interior reported on Tuesday 348 “troublemakers” had been arrested following street battles between police and protesters. 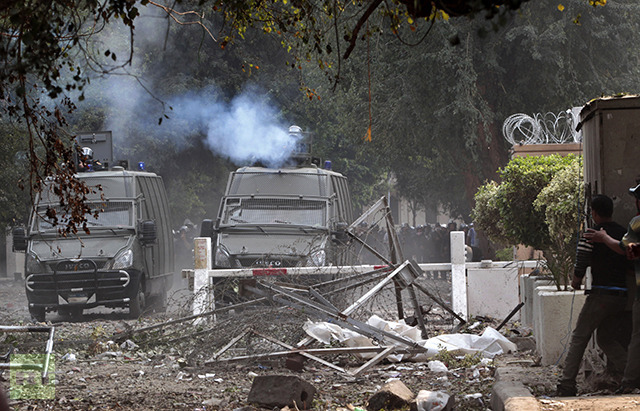 Around 216 policemen were reportedly injured in the clashes. Liberal and secular demonstrators, as well as those loyal to former president Hosni Mubarak, have been staging sit-in protests on the square since Friday to demand President Mohamed Morsi revoke recent decrees granting him sweeping powers. 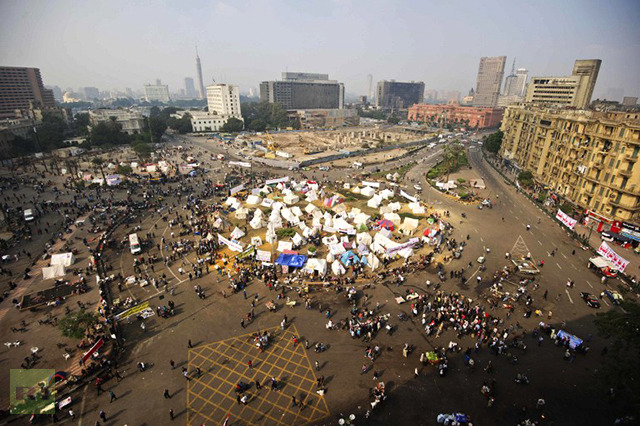 Later in the evening, tends of thousands poured onto Tahrir Square aftering marching from various points throughout the city. 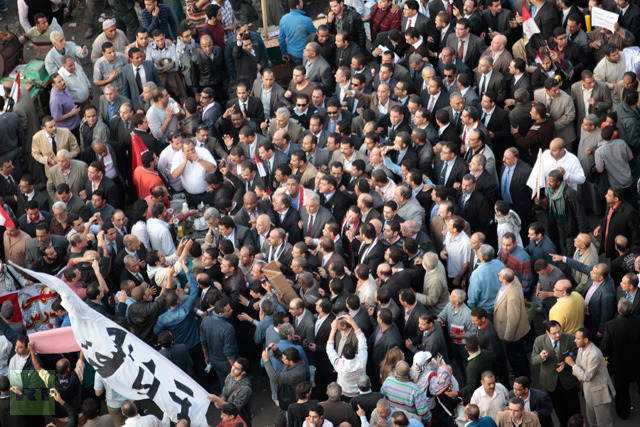 Amidst a sea of Egyptian flags, the crowd chanted slogans against Morsi and the Muslim Brotherhood. 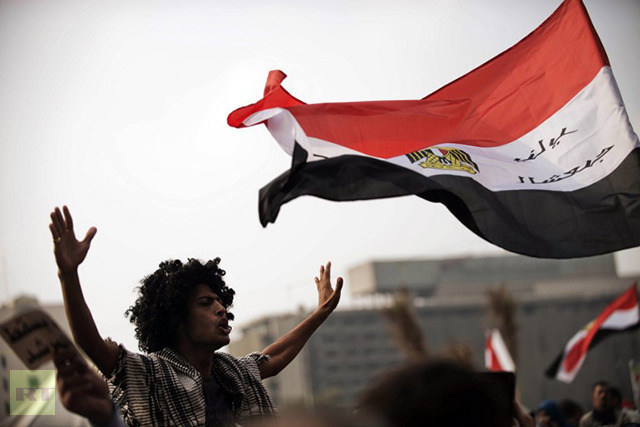 The Muslim Brotherhood, who backed Morsi’s presidential bid, and the ultraconservative Nour party decided to cancel a counterdemonstration amidst concerns it would lead to more violence. Rallies are also being held in the Nile Delta cities of Mansura, Tanta and Mahla and in the central provinces of Assiut, Sohag and Minya. Thousands of protesters in Mahla, who gathered on the central square claim to have come under fire during their rally. 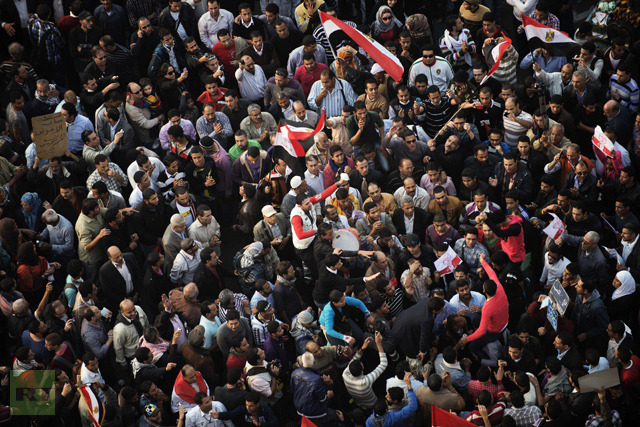 “People started chanting against Morsy and the Muslim Brotherhood while in the square which is near the Freedom and Justice Party (FJP) headquarters,” and “suddenly bullets started flying everywhere from the FJP direction.” Mohamed Fathi told Daily News Egypt. Khaled El-Shami, editor of the Al Quds Al-Arabi newspaper, said the ongoing protests are not a reflection of any sectarian divide, but rather a stand-off between political Islamists and supporters of civil rights. “Looking at this crowd, you cannot tell who is Muslim or Christian, who is liberal or leftist, this is the real people of Egypt that have always been known as moderates saying no to new religious fascism making the president above the law,” he said. “The people of Egypt, who I believe are the majority, are going to insist that this decree be canceled,” El-Shami continued. Meanwhile, former presidential candidate Hamdeen Sabahy has launched a movement called the Popular Current and has joined several other opposition leaders to denounce the decree. 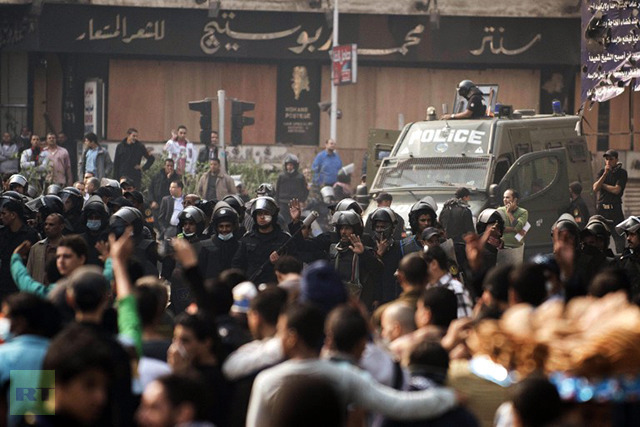 Yet President Morsi insists that his power seizure is “temporary”, and is open to political dialogue. 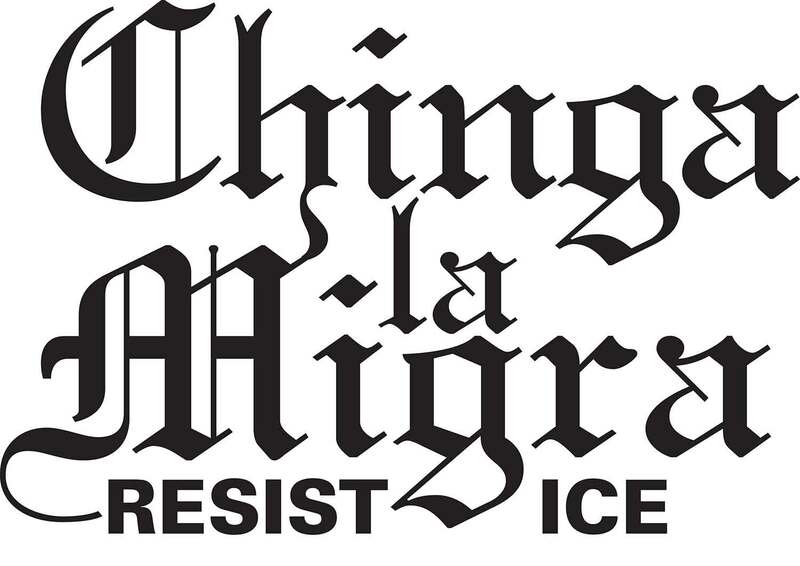 He had agreed to meet the country’s judges on Monday to negotiate a solution to the crisis, though no amendments to the declaration were forthcoming. On Thursday Morsi issued an edict which effectively eliminated judicial oversight of his decrees, laws and decisions until a new constitution is ratified. 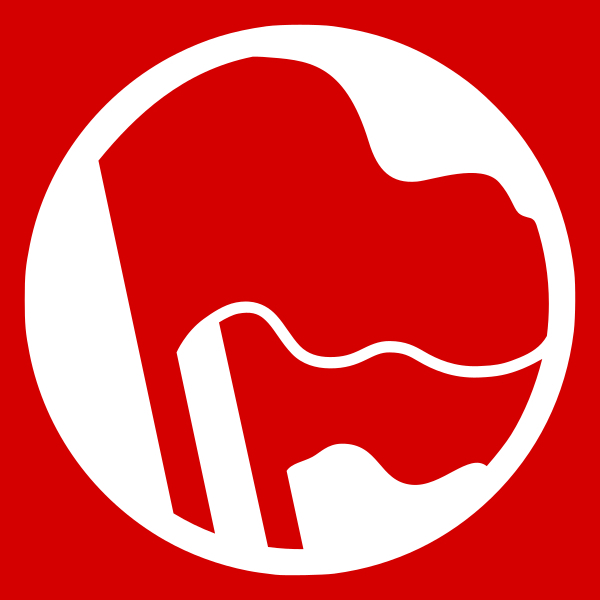 He further said no court could dissolve the Islamist-dominated constituent assembly which is currently drafting the country’s new national charter. He extended the assembly’s deadline to finish drafting the new constitution by two months, which was previously scheduled to be completed by December 5. Since Thursday’s announcement, a number of Freedom and Justice Party and Muslim Brotherhood offices throughout the country have been torched – while more than 500 people have been injured in violent protests. 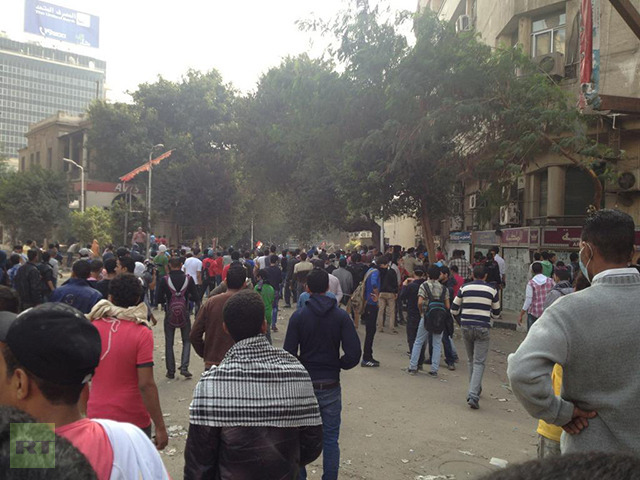 One person has been killed and dozens injured as anti-government protesters attacked a provincial capital’s Muslim Brotherhood office. Meanwhile, more than 1,000 strikes have taken place in the past two months, which signals the largest wave of industrial action since the fall of Hosni Mubarak. 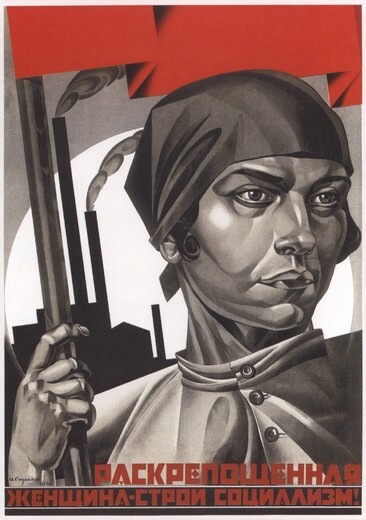 This has included action by the nation’s 100,000 doctors, who have threatened to resign en masse. 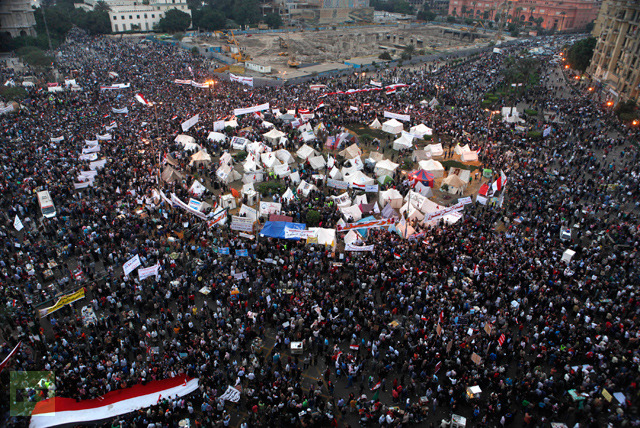 One of Morsi’s main aims through the acquisition of further powers was to deal with this emerging social movement.